In Triple Threat, a high-action, romantic suspense story, an all-grown-up Katie Brandt, now 20, closes out the Pure Genius Series by using her doctoral research to ferret out participants in a planned, 3-pronged terror attack on the US, an attack that dwarfs 9-11. Katie, who has been engaging terrorists on their cyber turf, earns the name Crazy Kate, by proposing that 23-year-old, doctoral candidate Joshua West help her engage the conspirators on real turf in order to gain incriminating evidence. Katie, armed with a 180 IQ, a slender, 5′ 9″ athletic body, and her great-granddad’s Karate, makes a formidable opponent, one who already has 2 notches on her gun. When Josh joins her, the story erupts in a war of deadly weapons and wits. But Katie and Josh must also fight each other in a war of words spawned by their opposing worldviews, a war Katie must win before she can pursue a relationship with Josh. Whenever she mentions her faith, an argument breaks out. Over the course of the book, Josh forces Katie to answer nearly every major objection to her faith. Let’s have a bit of fun. In the excerpt below, Josh takes exception to Katie calling British Columbia’s beautiful Howe Sound part of “creation.” Katie’s approach to Josh’s challenge is brilliant in that she goes for the heart of the underlying issue, the nature of truth. By the time they rounded the turn above Horseshoe Bay, the morning sun had topped the mountains and lit the water in Howe Sound. The view from the road, high on the side of the mountain, took her breath away. “All truth is relative. That’s…uh, self-contradictory.” A deep frown grew on his brow. You mean for the sake of Joshua West. After her diatribe on truth, Josh went silent for nearly an hour. The snowcapped mountain on the right was Whistler peak. The village was only three or four miles ahead. They had to function as a team and play the role of honeymooners. Josh needed to start talking to her or they should call off the honeymoon and drive home. “Yeah, sure.” Their intense discussion was behind them. But the subject would come up again. She would see that it did. “There’s the entrance to the village. Time to get serious. The person here is dangerous. We can’t afford mistakes.” She opened her map of Whistler. 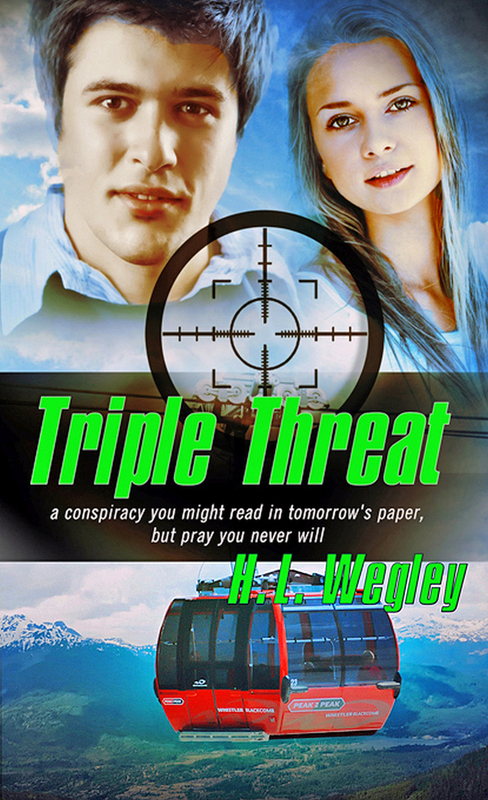 Triple Threat is available in softcover and most eBook formats. The Kindle version is on sale for $2.99 at Amazon from now to release day, November 14. An adventure that spans the Pacific Northwest from the shores of the Olympic Peninsula to the mountains of Whistler BC. Stay tuned for more photos of the Whistler setting for Triple Threat.